I saw Mr. Lif a couple weeks ago performing alongside Aesop Rock in Minneapolis. Needless to say, that was simply one of the most mind-blowing concerts I've ever seen. Both emcees were nailing every verse on point. 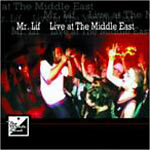 That was enough for me to somewhat complete my Mr. Lif collection with "Live at The Middle East". The first thing that should be pointed out, if you don't already know, is that this was not recorded "in" the Middle East. "The Middle East" is a nightclub in Cambridge, Massachusetts. Lif makes it clear in the liner notes, as to what this album is all about - "This is not a live album...It's one show, presented in the rawest possible form, mistakes and all." Quite a gutsy move for a guy making his debut to the world. But on the other hand, how unique. The album is all over the board, chronologically speaking. He performs jams from his old unreleased material dating back to 1997, to jams in their rawest form from his forthcoming full-release, "I Phantom" (one year before it's release). It's true, that live albums are not regarded as being valued as much as a full release. But that's not the case here. This works as a fine introduction to Mr. Lif. This album, more than others, gives you a deeper look into his character, sense of humor, and his exciting on-stage persona. Mr. Lif isn't your average hip-hop artist. The fact that he is subjecting new, unrecorded material to a live audience is unheard of in hip-hop. It took me by surprise when I saw him live a couple of weeks ago. I got to hear a bunch of material off of his forthcoming 2006 full-release. His incredible live performance, unlike many others, holds your attention to it's fullest, which merits huge respect points. Mr. Lif is truly a working class b-boy. The subject matter, messages, and lyrical approach is very reminiscent of Blastmaster KRS-One, and Chuck D from Public Enemy. He's a true protest rapper who has endless ideas on how to approach hip-hop as an art form, and a teaching tool. Whether he's delivering messages of 9 to 5 hell on "Live from the Plantation", rapping about nuclear war on "Earthcrusher", or rhyming about how he beat his DJ in Nintendo on "I Beat Ak in FIFA 98", Mr. Lif always come off as engaging and exciting to listen to. Most importantly, this album shows how intelligent Lif is. His style is unmatched, even in the underground. And regarding the production; it's good. With live albums (especially an underground rap debut like this), you want to capture the true essence of a live show. In that respect, he has succeeded. The lyrics are easy to understand and sound very clear, along with the beats and cuts. The "live" part doesn't muddle his message in the slightest. The only complaint I have about the album, is that the music stops a lot. Although I find Lif's commentary interesting, there is a break after (or in the middle) of every song. It's still a charming listen, but loses a little momentum for repeat listeners. All in all, this album is worth every penny. If skills sold records, Lif would be going platinum with this one. But unfortunately, this gem will most likely be overlooked, even in the underground. A large part of that will be due to the "live" part of it. It will most likely be a cult classic that owners of studio released Mr. Lif will discover (like myself). But rightly so, I would have to recommend "I Phantom" or "Emergency Rations" first. But if you are already into one of those, you should find "Live at The Middle East" quite the rewarding listen.